released video messages of Yuna who will be competing at the World Championships. Kim YunaㅣHello, members of the E1 Orange Card. I’m Kim Yuna, a member of the national figure skating team. I’ll probably be training hard for the World Championships or may even be competing there by the time that this video is aired. To tell the truth, I am a bit nervous about competing at a big event after spending time away from competitive ice. However, all the support that you sent helped me through the tough training. I will do my best at Worlds to return the enormous support you have gifted me with. Please continue to root for me. Kim Yuna | Both Jin-Seo and I are training hard for the World Championships. The results of this competition will decide the number of skaters each country is allowed to send to the 2014 Sochi Winter Olympics. We will do our best to bring home good results. 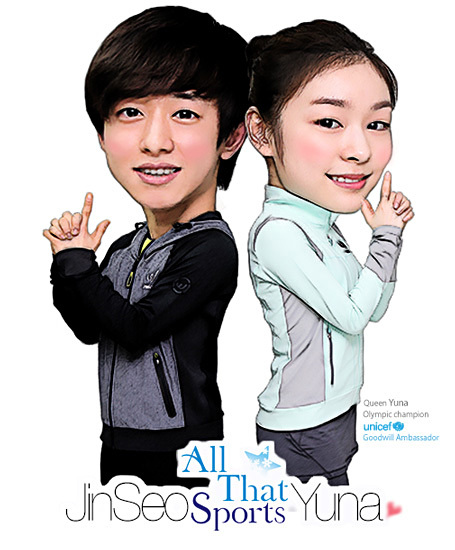 Kim Yuna & Kim Jin Seo | Prospecs W Fighting!